On October 27, 2005, less than four weeks after his final appearance of the 2005 baseball season, St. Louis Cardinal pitcher Cal Eldred announced his retirement. The disclosure was somewhat surprising in that Eldred was coming off a season in which he posted a 2.19 earned run average (ERA) over thirty-seven innings. His workload, without question, was far lighter than in his prime seasons during the 1990s, but he had shown that, in some situations, he could still perform effectively at the highest level of the baseball pyramid. Eldred’s body, primarily his pitching elbow but followed closely by the other parts, finally forced the hurler to walk away from a game at which he excelled. Calvin John Eldred was born on November 24, 1967, in Cedar Rapids, Iowa. He grew up, one of six children, in a community approximately fifteen miles west of that city, in Urbana, and in the midst of an area with an extraordinarily rich baseball tradition. His father, Chuck, worked for the Shellsburg Cable Company and for Farmers’ Mutual Telephone, and his mother, Charlotte, stayed home to raise the family. Nearby Vinton had been home to Bing Miller, a member of Connie Mack’s dynastic Athletics of the late 1920s and early 1930s, while just a bit further to the south lies the hamlet of Norway – itself having produced four major leaguers, including Hal Trosky and his son, Bruce Kimm, and Mike Boddicker – and whose legendary high school program was at a zenith during Eldred’s high school years. Cal’s high school career was itself a testament to excellence. On the basketball court, the 6’4” athlete averaged twenty-seven points and fourteen rebounds per game during his senior season, and was twice named to the all-state squad during his four years. On the baseball diamond, however, he was even more accomplished. As a pitcher he posted a career 51-13 win-loss record, 635 strikeouts, and a 1.58 ERA over 365 innings. He also batted .445 and stole ninety bases. As with basketball, he was twice all-state in baseball, and after a senior campaign in which he won eleven games and logged a 0.88 ERA, he was selected as a high school All-American (third team). At the end of his final season, the New York Mets drafted him in the 26th round of the 1986 June amateur draft. Eldred declined the offer, instead choosing to enroll at the University of Iowa, where he immediately rose to the top of the pitching staff. As a freshman, in 1987, he threw three complete-game victories, including a one-hit gem against Northwestern University. The next season he accrued six more complete-game wins, and led the team in innings pitched with seventy-eight, and starts with twelve. That summer he took advantage of an invitation to play in the Alaska Summer League, and garnered a 7-2 record and 2.10 ERA against some of the top amateur talent in the country. In his junior year, 1989, Eldred led the Hawkeyes with sixty-four strikeouts and seven wins. The end of that school year also marked the end of Cal’s University of Iowa career, as the Milwaukee Brewers made him the seventeenth overall pick in the 1989 June draft. Eldred left Iowa after three years with 177 career strikeouts (as of 2011 the fourth best, all time, at the school) and 218 innings pitched (fifth all time). After signing with the Brewers on June 24, Eldred reported to Beloit of the Class A Midwest League, and logged a 2.30 ERA over thirty-one innings. The next season found the twenty-two year-old at Stockton, in the California League, where he went 4-2 and lowered his ERA to 1.62 in fifty innings against a higher level of competition, and then El Paso, where he went 5-4 in the Texas League . In 1991 pitched for AAA Denver (American Association), where he won 13 against 9 losses, before getting a late season call-up to Milwaukee. On September 24, 1991, Cal Eldred made his major league debut against the New York Yankees. Over sixteen innings that fall, Cal went 2-0 with a 4.50 ERA. 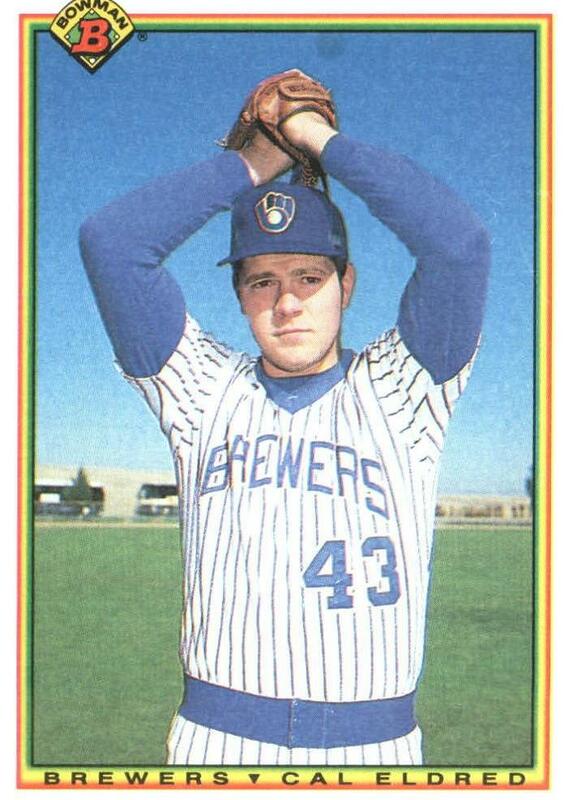 After a winter in Iowa, his home after every succeeding season, and a half year in Denver, where he won ten games in nineteen starts, the Brewers recalled Eldred for good in 1992. His performance over the second half of that season, an 11-2 record in fourteen games, earned him fourth place in the voting for the American League Rookie of the Year award. He threw a league leading 258 innings in 1993, while winning sixteen games, and quickly became tagged as a reliable weapon on the staff when he won eleven more in the abbreviated 1994 season. In 1995, however, Eldred faced a difficult career decision. After his fourth start, elbow soreness forced the team to place him on the disabled list. After additional examination, team physicians recommended he undergo “Tommy John” surgery; the ligament transplant, performed by Dr. Lewis Yocum, took him off the mound for thirteen months. Following six rehabilitation starts in AAA New Orleans the next year, he returned to the major leagues on July 14, 1996, against the Toronto Blue Jays. Eldred did not factor in the decision, a 7-5 Brewers loss, but did hold Toronto to three runs over seven innings in his return. Eldred married Christi Dufoe after turning professional, and the couple soon welcomed their first of five children, son “C.J.” He would later be joined by a brother, Luke, and three sisters, Emily, Abigail, and Hollee. The Eldreds, deeply devout Christians, dealt with the family instability induced by the rhythms of a baseball-driven schedule by home schooling the children. Eldred pitched well for Chicago in the early going of the 2000, with ten victories by the mid-July All-Star break, but in a Friday night inter-league game on July 14 against the Cardinals, while facing Thomas Howard with one out in the top of the fifth inning, he felt the elbow give out again. Cal managed to strike out Howard, but immediately left the game. The Associated Press quoted general manager Kenny Williams’ report that the bone scan showed a “mild reaction but nothing of high intensity.” Eldred was placed on the disabled list on July 17 and finally allowed surgeons to implant a five-inch screw in the offending joint to prevent the recurrence of stress fractures. It did not work as well as planned. In a subsequent instructional league rehab start in Arizona, he lifted himself after two innings. On November 8, 2000, the White Sox granted Eldred free agency, but re-signed him a month later, on December 7. The following spring, as the 2001 spring training camp opened, hopes were guarded for the Sox. Mark Bechtel of Sports Illustrated (March 26) reported: “Cal Eldred is the key to this staff: He has a plus fastball and a hard power curve. Eldred and James Baldwin have to stay healthy or the White Sox are finished.” The prognostication was accurate, and when Eldred left an April start against the Indians after enduring two innings, the Chicago season was effectively over. “When I saw him leaving the game, I knew it was his elbow,” said Christi. “He didn't even remember walking off the field and the pain made him nauseous,” reported Tiernan McKay. Eldred was, again, placed on the disabled list on April 11, and then was officially shut down for the season on August 8 when he was transferred to the sixty-day DL. Frustrated but looking at life realistically, Cal spent the rest of 2001 and the entire 2002 baseball season doing everything but playing baseball. He spent the time with his family in Iowa, completely resting his damaged elbow. After a great deal of reflection and self-evaluation, he came to understand that his inner, competitive fire was not yet extinguished. Eighteen months after walking off the mound, he gingerly picked up, and tossed, a baseball again. He expected pain, but it did not come. Encouraged, he gathered Christi and the family and headed to Arizona, where he could continue working out. Again he told Tiernan McKay, “At first I wasn't sure about everything that was happening. Then I figured I had nothing to lose and everything to gain, so I went for it.” On November 6, 2002, he held a public workout for approximately twenty scouts, and threw well enough to convince the St. Louis Cardinals to sign him as a free agent in the offseason. On Opening Day against none other than the Milwaukee Brewers, Cardinal manager Tony LaRussa put reliever Cal Eldred into the game in the top of the ninth inning with one out and sitting atop an 11-7 lead. The first Brewer batter, Eric Young, doubled to left field. He was followed by Richie Sexson, who homered, and then by Keith Ginter, who blistered a line drive single to left. LaRussa returned to the mound to lift Eldred, replacing him with Steve Kline for the save. Given the road Cal had travelled to return to a major league mound, it was a remarkable performance for the man, but not the sort that would keep him employed in St. Louis. As McKay later quoted Eldred, “Facing guys who have already had a few at-bats in a game is hard because they are really aggressive at that point. With only four or five relief appearances in my entire career, I had to make a huge adjustment to my approach.” Eldred was back, and the thirty-five-year-old finished 2003 with a 7-4 record, eight saves, and an ERA under 4.00 over more than sixty-five innings. The next year, 2004, Cal posted similar numbers for innings and ERA, and finished 4-2. That season also offered Eldred his sole opportunity to pitch in the World Series, when he appeared in two games against the Boston Red Sox. In 2005 the Cardinals re-signed the reliever, but he returned to the DL on April 15, this time for an infection in his heart lining called myopericarditis. He did not return until June 12. On October 1, 2005, Eldred entered a Saturday game against the Cincinnati Reds in the top of the seventh inning and induced Aaron Holbert to fly out and Ryan Freel to strike out swinging. His final professional pitch, though, was a 3-1 offering to Felipe Lopez, who homered. Immediately thereafter, Eldred left the ball game, and the diamond, for good. Cal Eldred won eighty-six major league games over fourteen years. He is happily married with five growing children, lives a short drive from the town in which he was raised and from the college at which he was discovered, and is deeply enmeshed in the game he loves. It would be difficult, perhaps impossible, to judge his life anything less than an unqualified success. Olson, Drew. “Happy, healthy Eldred ready to be No.1 again” Milwaukee Journal Sentinel (March 31, 1998). St. Louis Post-Dispatch – various issues. The Sporting News – various issues. Wisconsin State Journal (July 11, 1996) – uncredited note.